February 1941, wartime Berlin. Brilliant, idealistic young detective Georg Heuser joins the Murder Squad in the midst of the biggest manhunt the city has ever seen. A serial killer is slaughtering women on S-Bahn trains and leaving their battered bodies by the tracks. Heuser must confront evil eye-to-eye as he helps track down the murderer. July 1959, peacetime West Germany: a pioneering young lawyer, Paula Siebert, is the sole woman in a federal unit investigating men who have committed crimes of unimaginable magnitude and horror. Their leader has just been arrested. His name is Georg Heuser. Siebert is sure of his guilt. But one question haunts her: how could a once decent man have become a sadistic monster? The answer lies in the desolate wastes of the Russian Front, the vast landmass conquered by Hitler’s forces… the new empire the Nazis call Ostland. 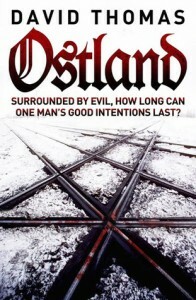 Based on an extraordinary true story, Ostland is a gripping detective thriller, a harrowing account of the Holocaust and a thought-provoking examination of the capacity for sin that lurks in every human soul. Similar in theme to The Kindly Ones by Jonathan Littell this book deserves better than its clichéd thriller cover. Ostland is a book of two parts; the first half is what you are expecting, a hunt for a serial killer and a rather disturbing one at that. Then at about the halfway point the narrative takes an unexpected turn and the real story begins. The second half tells of one good man’s descent into evil through the brutalising effects of the Holocaust. Heuser slowly changes from a Berlin policeman who wanted to protect the innocent and uphold justice into mass murdering Nazi. The first person approach does allow you glimpses of what turned a decent man into a monster.